Below is the text of a sermon delivered by Mary Conliffe, Anglican member of the Governing Board of The Canadian Council of Churches, at Anglican Church House at the end of the Week of Prayer 2018. 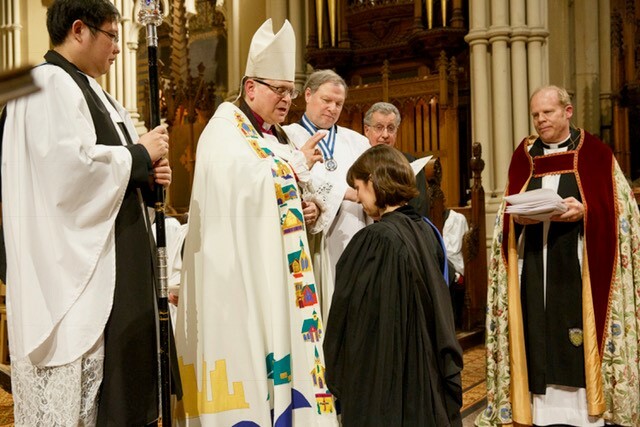 Mary was recently made an honorary canon of the Diocese of Toronto. I speak to you in the name of the Father and of the Son and of the Holy Spirit. Amen. I said, “I think I was invited because I am one of the Anglican Representative Members of the Governing Board of Canadian Council of Churches, not because I’m staff at the Diocese of Toronto!” So I’m hoping that that is the case, as that is the assumption I am proceeding with for the next several minutes! But my husband’s joke – and I think it was a joke - did raise an interesting reflection for me, which is that Anglicans especially, I think, are very good at ecumenical dialogue – perhaps because we so often get to practice it amongst ourselves! I want to say that it is a real joy to be a member of the Governing Board of the Canadian Council of Churches, and I’d like to thank the Anglican Church of Canada for the opportunity and privilege to serve as one of their representatives. The Governing Board of the Canadian Council of Churches is an amazing and diverse group of people, and I can now, after three years, say that I have a diversity of Christian friends that I never had before. We are at a curious time in the history of ecumenism – a wonderful time, a healthy time, I believe – where the social context especially in the West has changed so much and brought to bear a real energy for mutual support in the Church. Christians, increasingly marginalized if not utterly forgotten in our affluent and secular society, find their commonality in a shared faith in Christ Jesus to be a source of comfort and encouragement and strength. We tend to call this age we’re living in “post-denominational”, and we know that people are much less likely to affiliate with any one church tradition out of bias or family loyalty. So this makes the divisions in the Church – which believe me I am not trivializing – they are real and they are in some cases significant – both an unquestioned reality to those of us who are “churched”, and also increasingly inexplicable to the unchurched society in which we live. The resulting broken witness to the world becomes a hindrance to the furthering of the Reign of God. And the great irony is that we’re in a time now where for many people acceptance of diversity when it comes to doctrine, worship, and understanding, is far more generously offered to other denominations than it is to our own. So here we are at the close of the 2018 Week of Prayer for Christian Unity. For what should we pray? Well, as you know in Gospel of John, Chapter 17 Jesus himself prayed that the Church may be one that the world may believe. And in today’s Gospel passage from Matthew 10, Jesus again speaks of bearing witness to the world for his sake, for the sake of the Gospel. The unity of the Church is not just an aspirational ideal (one that we may at times write off as unrealistic and unachievable) - but the expressed desire of Christ, as part of his plan to reconcile the world to himself. Today we celebrate the Conversion of St Paul. Today we heard again the wonderful sacred story of Saul, a religious zealot, honestly believing himself to be acting in faithfulness to God by condemning the Church and persecuting Christians. Yet this is the day that we commemorate when Saul *saw* Christ for the first time, in a very real way. He was converted from his spiritual blindness by a physical blindness in an encounter of seeing the living Christ. When we see Christ in the other – “seek and serve Christ in all persons” as we promised in our baptism – we are transformed to grow the body of Christ in the Church and support its unity. When we actively listen to the other and ask humbly to “show us the Christ you have seen”, when we acknowledge and wrestle with differences and disagreements, we glorify God in maintaining the primacy of the unity of the Church. I love that the Week of Prayer falls between two feast days: January 18th’s Confession of St Peter and January 25th’s Conversion of St Paul. Two such different apostles: Peter and Paul. Peter and Paul were originally Simon and Saul, but for these two disciples, their encounters with Jesus changed them, changed their opinions, changed their identities – even down to their names! Yet they were both compelled by the encounter to commit their lives to the Mission of God in sharing the good news of Christ: Peter to the faithful in Jerusalem and Paul to the Gentile world. The Book of Acts and their letters in the scriptures share some of the history of the conflicts and difficulties and differences of opinions that they had to work out. They quite possibly never liked each other very much. Yet for all their differences, the unity of the Church remained paramount because Peter and Paul always recognized that the other had seen Jesus, and were open to hearing what the other’s experience of Jesus had been. We too must be on guard that our righteousness of truth – the truth as we have received it – does not blind us to seeing the Christ in the other: in the other who is de-churched, unchurched, other-churched, or even in our own Church. So, in this week of Prayer for Christian Unity, I invite you to pray for the unity of the Church – not so much that all Christians will be uniform in thought and word and belief, but that all Christians may be united in honouring Christ in each other, of recognising the divine presence in our brothers and sisters, and in demonstrating to the world that we are one in the spirit and one in the Lord.